After permanently beefing up its coverage in Washington, D.C. for the presidential inauguration, T-Mobile today revealed that it’s done something similar for Houston, Texas. T-Mobile has rolled out upgrades to its 4G LTE network in Houston ahead of Super Bowl LI on February 5. T-Mo touts that its LTE capacity has grown nearly 20 times in and around NRG Stadium, where the Super Bowl will be played, as well as 10 times at airports and hotels in the area and a total of 5 times across the entire Houston metro. Specifically, T-Mobile added more LTE spectrum, including Extended Range LTE; rolled out three carrier aggregation for a total of 35+35 MHz of LTE; added new small cells and Distributed Antenna Systems; and enabled 4×4 MIMO and 256 QAM. Keep in mind that some upgrades will only benefit you if you’ve got a compatible device, like how the Galaxy S7 and S7 edge support 4×4 MIMO and 256 QAM. 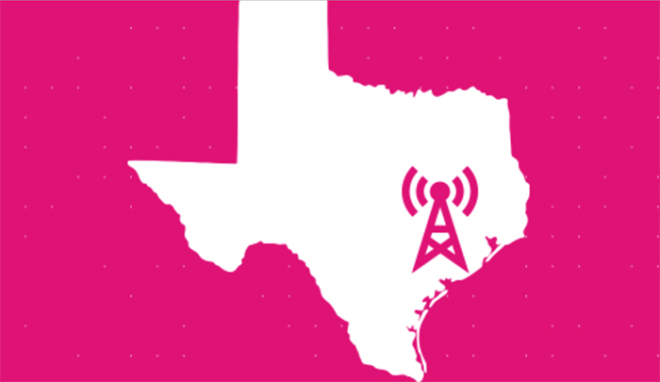 As with the upgrades that T-Mobile performed in Washington, D.C., the network improvements that T-Mobile has rolled out in Houston are permanent. That means that the residents of Houston will continue to enjoy the upgrades after all of the Falcons and Patriots fans have left town. interesting, because I was leaving my office just yesterday on Stella Link and 610 (1 exit pass NRG stadium) and tried to make a few calls for about 5 mins and wouldn’t connected. iPhone 7 also. iPhone 7 is not MIMO, QAM and 3xCA compatible…sorry dude! Idk iPhone 7 plus here and I have gotten up to 150 Mbps down and 20 up in a few places like south gate and Glendale . I live in LA by downtown and there I never get speeds like that ..I don’t know what the iPhone uses if it uses carrier aggregation or not But that’s more than enough for me . . I mean cmon 120 is more than enough to Do ANYTHING. MY mom has a galaxy s7 edge and It’s same thing here in LA . In places I get high speeds she gets high speeds in places were signal is bad and I get crappy speeds she does too. And I know the iPhone 7plus can handle higher speeds because I connected it to the time Warner wifi before and gotten 300 Mbps on it. Have screen shot to prove it. Only thing T-Mobile network here obviously don’t offer those speeds . If it did I’m sure the iPhone would get them without a problem. That’s why I wanna know what it supports? because when I got 150 on Lte what was I using some type of carrier aggregation or what ? Unless it’s a company phone, it may be time for a grown man phone. T-Mobile iPhone 7and 7 Plus are using the Intel Modem which is lower quality then the unlocked models Qualcomm modem. I was dropping to 4G constantly in places I used to get 5 bars. Calls are regularly getting dropped and the speed test was worse. I was getting 12 down and 5 up sometimes 20 d 6 u even though the regular speed was supposed to be 100d 30u. So after reading your comment decided to test it for myself wow didn’t realize the difference. Bottom two test were done simultaneously. The rest were done one at a time. I thought this was disproved because Apple was throttling the Qualcomm modem so it matched the performance of the slower Intel one? Apple throttled the maximum theoretical speed only they can’t throttle anything else regarding the modems. Reception is way better on the Qualcomm and speeds. Also the Qualcomm stays connected to LTE while Intels keeps on dropping to 4g and dropping calls constantly. I notice that my iPhone 7 Plus (purchased full-price on apple.com for Tmo) will get stuck on a set number of service bubbles as I drive around. I have Apple Car Play in my truck and it shows the bubbles of service on the screen, and they will stay the same while I know what areas have 5 bubbles and what areas have 1 bubble. Not sure if its due to the Intel modem, Car Play software, Carrier settings, or just iOS in general. I’ve noticed it since about iOS 10.1. I can confirm T-Mobile’s downtown Houston network is dynamite. The DAS in the tunnel system provides 50-100mbps download speeds and street level is almost always 20+mbps with areas approaching 100mbps. This certainly was not the case 6 months ago. I’m curious to see how the added capacity stacks up against the crowds. Also, the upgrades at NRG are exciting, especially with Rodeo Houston coming up. Am an uber driver and while I use a galaxy on 5, which probably won’t take full advantage of the network upgrades, it’s welcoming to see t mobile invest heavily in us. I understand phones are expensive; however, upgrading would bring a night and day difference to your experience. Not worth it just yet, I only use this Samsung as my uber phone, my main driver is a lumia 950 xl so going from that to the Alcatel wm10 will honestly be a downgrade. Are mimo, qam and 3ca just software updates? No need to climb towers right? I’m sure there is some hardware needed, because phones need more advanced hardware as well. Hence why only the GS7 can use 4×4 MIMO and 256 QAM. But, they have said everything is in place across hundred of markets. The phones just need to catch up to Tmo. The Senior Bowl is in Mobile, AL this week… Where is that Permanent LTE Enhancement? HUH? Is that where old men run around and get hip fractures? I’ll be heading down there for the festivities so I’ll be sure to check out the improved coverage/speeds while I’m there. If it’s true you’ll get 20mbps, up from 1mbps, 20X you know. Why don’t u go post that at a Verizon forum? O wait I forgot they dont have one . I seen your post before were you praise Verizon for working better than T-Mobile. Yes we all know Verizon has better coverage than any other carrier . You don’t have to be reminding us everyday. . Luckily here in Los Angeles T-Mobile works much better than Verizon . So I’m happy. So yea most of us on here don’t care .That Verizon is doing the same thing . Or about any other Verizon thing u post . I agree Omar . Yes we all know he had a bad experience with T-Mobile he has made it very clear before . And how he’s now happy with Verizon . But like u said this is a T-Mobile forum . He’s always posting Verizon this , Verizon that on here gets annoying after a while . That’s not the case in Las Vegas. I work for UNLV and in the Lied library TMO puts all the other carriers to shame. IOT and my director says they did away with AT&T and now has a contract with T-MOBILE and the doing upgrades on the entire university on a department by department basis. I’m surprised Band 12 isn’t live in Vegas yet (or at least officially live). I’m sure they’ve started installing equipment for it by now. Of course, is not like other carriers are sitting on their hands. They critize you for posting this, but don’t worry, this is how to bust information bubbles. Getting better building penetration in SC now. I’m thinking band 12 is up and running now near Interstate 20 and Industrial Rd. During the inauguration, very sparsely attended, the data was spotty at best and slower than molasses… I got 0.26 down and 0.30 up near the Old Post Office. Yeah, my HTC 10 and Nexus 5x support the newly installed bands. Neither the htc 10 or 5x do 4×4 mimo or 256qam. They only do band 12. And also, you’re telling me you had both your phones with you and were testing them during the inauguration? They also don’t support 3 band carrier aggregation, only phones that do are s7 and s7 edge after the last update and the note 5 will also do it with an update. I also think the v20 does it. 4×4 MIMO, etc. were there, perhaps, but with no practical impact. Simply stated, in a big crowd there was no data connection despite all the promises. The reason 4x4mimo wasn’t working on your 5x is because it’s not capable. Currently only s7 phones are capable. And it has to be a t-mobile phone, although t-mobile said that an unlocked iPhone 7 will get updated to do 4x4mimo. In my house getting over 50mb down and 45mb upload. These are inside my brick house with blown insulation installed. These speeds are on my Samsung Galaxy S7 and my iphone 7. Never been happier!! My area, Suburban outside of Boston my speeds keep getting faster. Constantly upgrading towers. Thank You T-Mobile, Thank You John Legere! !